On July 12, 1993 a large earthquake off the west coast of Hokkaido and the small offshore island of Okushiri in the Sea of Japan/East Sea, generated a destructive tsunami. Origin Time - The earthquake occurred at 1317:12 UT, July 12, 1993. Epicenter: The epicenter of the earthquake was in the Sea of Japan/East Sea at 42.8 N, 139.2 E, about 15-30 km off the small offshore island of Okushiri along the west coast of Hokkaido. A total of 239 people were killed. More than half of the deaths were attributed to the tsunami. A total of 558 houses were destroyed. There were about $600 million in property losses caused primarily by the tsunami. It was reported that the western shore of Okushiri Island subsided by at least 80 cm. Subsidence of about 20-50 cm. was reported along the eastern shore. Japan is situated in an active seismic region. The plate tectonics of the Southern Kuril islands-Northern Hokkaido region are quite complex and very different than those along the southern portion of the Japanese Trench. The island of Hokkaido has been created by active arc-arc collision. The Sea of Japan/East Sea is a complex basin between Japan and the Korea/Okhotsk Sea Basin. 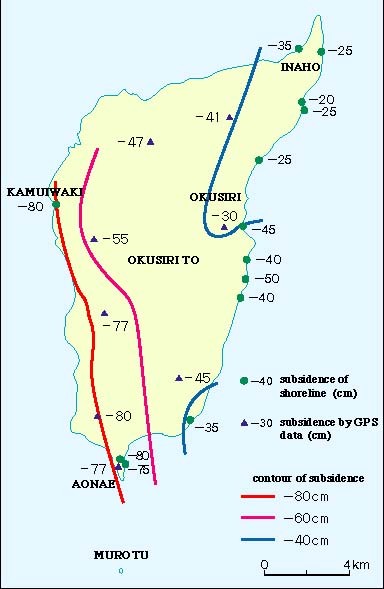 It represents a sub plate with apparent counterclockwise rotational movement as it interacts against the Okhotsk plate, along the inland sea boundary of the Hidaka Collision Zone (HCZ). A series of significant earthquakes in the Sea of Japan/East Sea indicates that there may be active collision of the North American plate with the Eurasian plate off the west coasts of Honshu and Hokkaido. However this is not confirmed and there may be a different scenario of tectonic interactions in this region. Near Hokkaido, earthquakes occur on the Pacific Ocean side along the Kuril and the Japan trenches as the Pacific plate moves against Hokkaido from an east-southeast direction at a rate of about 8 cm per year. The subduction of the Pacific Plate is at a rather steep angle along the Kuril Trench boundary. North of Hokkaido, Sakhalin Island which separates the Sea of Japan/East Sea from the Sea of Okhotsk is probably the result of transpressional tectonics along the North America-Eurasia boundary. Shallow earthquakes occur also on land areas of Hokkaido, along the southern Hidaka Mountains. These earthquakes may be the result of stresses caused by the Pacific plate's angular subduction which - according to some scientists - may even extend to the region along the eastern margin of the Sea of Japan/East Sea basin. Thus the major tsunamigenic earthquakes of 1993 and 1983 may be the result of such tectonic interactions of Pacific plate subduction off the west coasts of Honshu and Hokkaido, rather than of active collision of the North American plate with the Eurasian plate - as previously stated. The severity of the tsunamigenic earthquakes in 1983 and of this 1993 event, and the extensive subsidence that was observed on Okushiri Island (in 1993) would tend to support a tectonic mechanism associated with extended oblique subduction of the Pacific plate beneath a recently postulated Amurian microplate of the Eurasian tectonic block, along the Sea of Japan/East Sea. The earthquake of July 12. 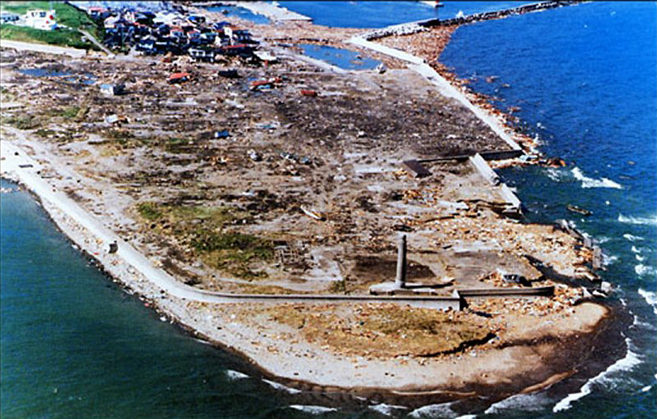 1993 generated a destructive tsunami which was particularly devastating at Okushiri Island and along the central west and southwestern shores of Hokkaido. Waves ranging from 5 to 10 meters in height crashed on the nearest coastlines, destroying fishing villages and killing 239 people. More than half of the fatalities were caused by the tsunami. The $600 million in property losses were attributed primarily to the tsunami. It took between two to seven minutes after the earthquake for the first of the destructive tsunami waves to strike the coastlines of Okushiri Island. The short tsunami travel time was confirmed by numerous battery-operated clocks that were found scattered with the debris along the shores of western Okushiri Island. Although the Japan Meteorological Agency (JMA) issued promptly a regional tsunami warning, because of the proximity of the tsunami source to the coastline, there was no sufficient time to warn coastal residents on Okushiri Island. However, since the 1983 tsunami, preparedness had greatly improved in this region and many coastal residents fled to higher ground when they felt the strong ground motions of the earthquake - thus, saving their lives. The destructive effects of the July 12. 1993 tsunami occurred mainly on the southwestern shores of Okushiri and Hokkaido. The west and southern coasts of Okushiri Island were struck by waves that exceeded 20 meters in many locations. There was extensive damage to ships, houses and structures. In a small valley near the harbor town of Monai, the maximum tsunami wave runup height was documented to be as much as 31 meters. Aonae - Waves ranging in height to over 10 meters breached the protective coastal walls of this small fishing village on Okushiri's southern peninsula, causing extensive damage to homes, buildings, vehicles and boats. The waves damaged gas lines and fuel storage containers, thus starting enormous fires that completed the destruction of all, still standing, structures. Primarily the earthquake and not the tsunami caused the destruction of the lighthouse at Cape Aonae. Monai - The village of Monai on the west coast of Okushiri Island was completely destroyed. The waves reached an elevation of nearly 20 m above sea level, flooding 300 m inland. Ten persons were killed there and 12 houses were destroyed. The Sea of Japan/East Sea along the west coast of Japan has a greater potential to generate earthquakes and tsunamis than previously believed. Current plate tectonic theory indicates a mechanism of extended subduction of the Pacific Plate underneath Japan and along the eastern boundary of the postulated Amurian microplate of the Eurasian tectonic block. However, tsunamis are not generated as frequently along the west coasts of Japan as they do along the eastern coasts. Nonetheless, the shallow ocean bathymetry and the morphology of the western coastlines of Hokkaido and Honshu Islands can contribute significantly to the destructiveness by tsunamis. The eastern Sea of Japan /East Sea, along the apparent collision (subduction? )boundary described above, is an active seismic zone. Earthquakes in this region have been responsible for the generation of local tsunamis which have caused considerable destruction along the Japanese, Russian and Korean coasts. There have been at least 6-8 major historic tsunamis in the last three centuries in the Sea of Japan/East Sea. A review of historic records in Japan and Korea will undoubtedly reveal the occurrence of many more tsunamis. The following are summaries of some of the better-known events. The Earthquake and Tsunami of 26 May 1983 - Almost ten years prior to the 1993 event, a similar earthquake (the Nihonkai Chubu Earthquake, M 7.7),) off the west coast of Aomori and Akita Prefectures in the Sea of Japan/East Sea generated a destructive tsunami which had maximum impact at the Akita Prefecture in the north-east part of Honshu Island, in northern Japan. The tsunami source region was close by. The first of the destructive waves struck the coast of Akita about seven minutes after the earthquake, completely destroying Oga Peninsula. The maximum tsunami height reached 14 meters. One hundred four persons perished. There was extensive destruction of houses, ships and port facilities. A total of 700 boats and 59 houses were destroyed and the total property loss was estimated at $800 million (1983 U.S. dollars). At Minehama, Honshu, the estimated tsunami heights were also up to 14 meters. Along southern Hokkaido and northern Honshu the waves ranged from 2-6 meters. There was tsunami damage as far away as the Yamaguchi Prefecture in southwestern Honshu. Destructive tsunami waves ranging in height between 2-7.5 meters struck the eastern and southern coasts of South Korea, where three people were killed. Also, waves ranging up to 8 meters struck the coast of Russia (USSR at the time). The Kamuizaki-Oki Earthquake and Tsunami of 1949 - This was a major earthquake (M = 7.5) which generated a destructive tsunami. At Uljin, Kyongsang-Pukdo, and the island of Ullung, on the east coast of Korea, the tsunami runup ranged up to 2.0m. There is no much information of its effects elsewhere. 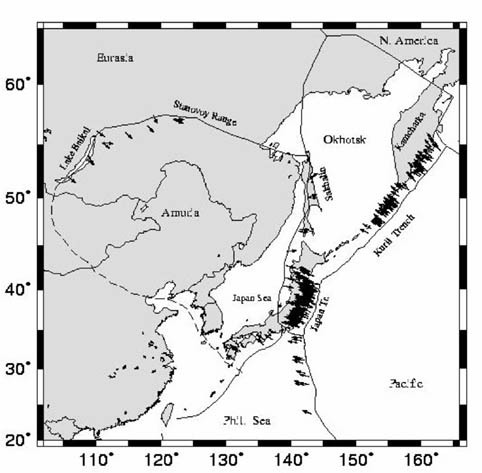 The Kampo Earthquake and Tsunami of 1741 - Records of the Choson Dynasty indicate that an earthquake in 1741 - with an estimated magnitude of M = 7.5 - occurred off the southwestern coast of Hokkaido, in the Sea of Japan/East Sea, and that it generated a destructive tsunami that struck the coast of Kangwondo, destroying houses, boats and killing about 1,500 people. The July 12, 1993 event was the second destructive tsunami in the Sea 0f Japan/East Sea within a ten-year interval. There were many lessons learned from this event about the potential of tsunami generation along this very active tectonic boundary. The closeness of the tsunami generating sources to populated coastal areas emphasized the need for better preparedness and for automated instrumentation and systems that can provide immediate warnings following major earthquakes. 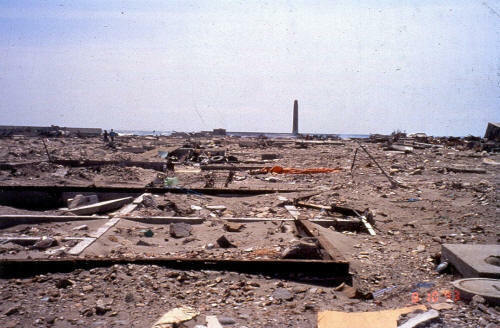 The 1993 Okushiri event was extensively documented and studied by scientists and Civil Defense authorities and much was learned about how to mitigate the effects of future tsunamis. Fortunately in Japan there is a great deal of public awareness of earthquake and tsunami risks. Eos Trans. AGU, 74, 417, 1993.